Well, this is an out-of-the-box functionality that salesforce provides, in case you have not heard about it before. This functionality allows you to capture the emails that you send from third party email clients and store them on your salesforce orgs as Activity records associated against the Contacts or Leads. So, how does this functionality work ? I will walk you through configuring up the functionality in this post. Before we begin, where do you think this functionality might help you ? If you are working in an enterprise and if you have all the people that you interact with on a daily basis, stored as either contacts or leads in your salesforce org, then this feature will record all the email communications that happen between you and your contacts. 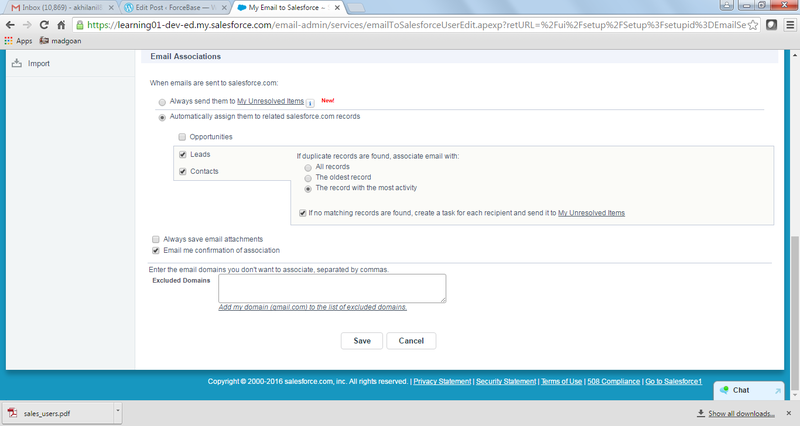 So suppose you send an email to person A with email id as “test1@gmail.com” with BCC to an email id provided by salesforce, then with this feature kept active, your salesforce org will search for a lead or a contact with email id “test1@gmail.com” and if it finds a record, then the email that you had sent will be created as an activity record against the associated lead or contact. Interesting isn’t it ? The functionality would be disabled by default. Click on edit and check the “Active” checkbox and save it. You will be asked if you want to send a notification to all your users, notifying them of this feature. You can skip this step, if you do not want to notify all your users. You should see the above page with your Email to Salesforce address listed out there. This is an auto-generated email address generated by salesforce and you cannot change it. Keep a copy of this address with you as you will need it while sending emails to your contacts or leads. An important point to be noted here is that you need to enter the sender email address using which you will be sending out emails to your leads and contacts. 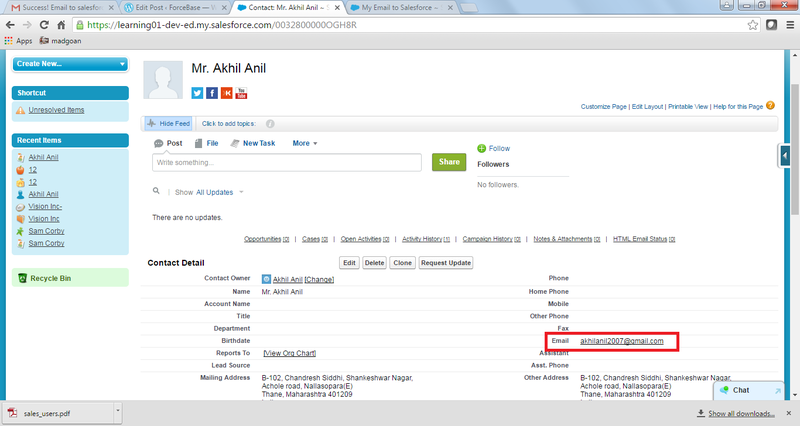 Only the emails sent out from the addresses mentioned on this page will be captured by the “Email to Salesforce” functionality. Now, if you scroll down, you will see that Salesforce provides a couple of settings for you to configure depending on your requirements. 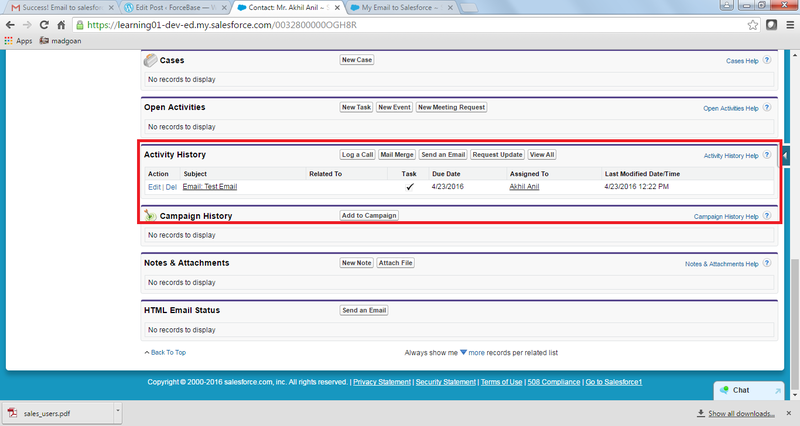 So, there might be a scenario wherein you send out an email which has more than one matching records in salesforce. In that case you choose to configure if you want the Activity record to be associated with just the oldest record, the record with the most activity or with all the matching records. There are a few more options that you can set on this page as seen below. Let’s save the page with the default settings as of now. Now that we are all set with this feature, let’s test it out ! 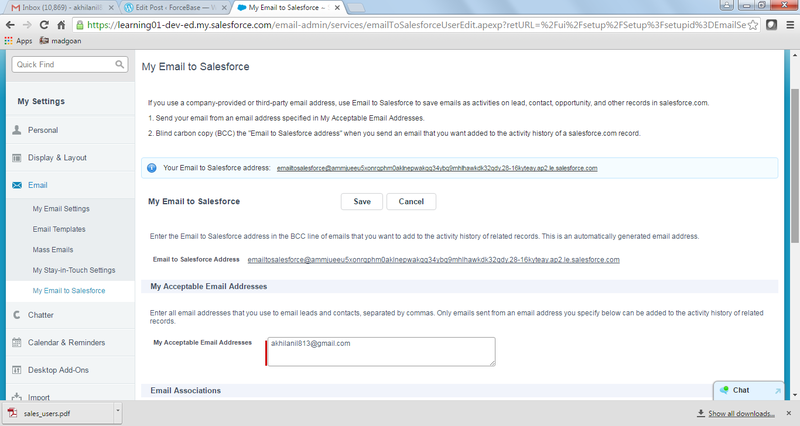 Try sending an email from one of the addresses you just mentioned in the “My Email to Salesforce” page to one of your contacts who has a record in salesforce with BCC to the “email to salesforce” address. Body: Hello, This is to test the email to salesforce funcitonality. 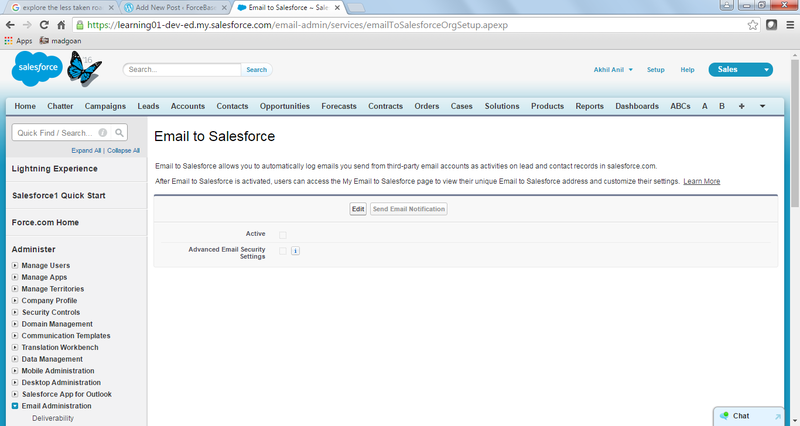 After the email has been sent, check your corresponding contact record in salesforce. It should have an activity record generated against it as seen below. The above Activity detail page shows the details that were sent as a part of the email. That’s all folks ! 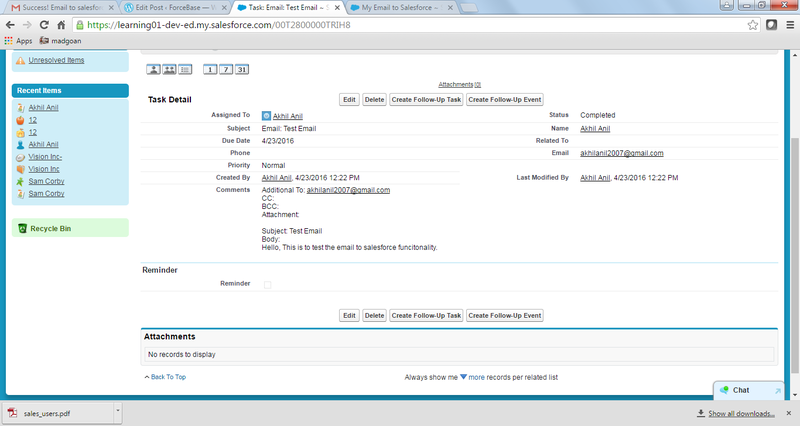 Happy using Email to Salesforce !!! Next Next post: Build a Validation by shaking hands with Workflow rules ! Agree this is powerful feature but limitation of adding emails of leads and contacts to salesforce restrict me for using this feature. Every time I work with new contact/lead I have to enter email address in this field which is not expected. Shrinivas you need not enter the email address of the Contact/Lead in any of the setup pages. It just picks up the email address from the Contact/Lead record which is assumed to be populated with the email address when the Contact/Lead record was created.